A Roman latrine, feeding into the Roman sewers. Why did the Romans build aqueducts and sewers? In larger Roman towns, people often got sick or died from drinking water that had sewage in it. Sewage is human waste – poop or pee. When people drink water with poop in it, they can get other people’s germs. They may get sick with dysentery or die. 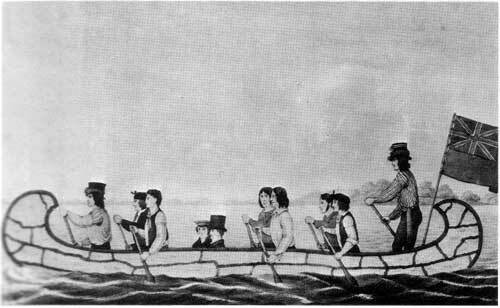 Dirty water was especially dangerous for babies and old people, and anyone who had been sick. To fix this problem, many Roman towns built aqueducts. The aqueducts brought in fresh water from the hills outside of the towns. 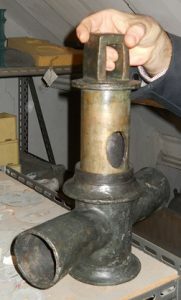 A Roman brass valve that allowed you to turn the water off and on in water pipes. 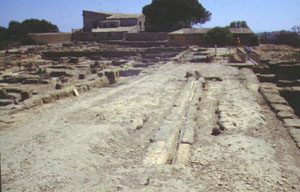 Inside Roman towns, water flowed through clay pipes or lead pipes. The pipes had valves in them so you could turn the water on or off, or control how much water flowed through the pipes. Did Roman lead pipes give people lead poisoning? Probably the lead pipes did result in somewhat higher levels of lead, which isn’t healthy. But Roman water didn’t stand in the pipes – it was always running, so it wouldn’t have picked up too much lead. The Romans knew what lead poisoning looked like, and if people had been getting it, they would have changed their system. How did the Romans deal with sewage? The Romans also built public latrines and systems of sewage pipes to carry sewage out of the streets and dump it into the river. Roman sewers were a big improvement on Greek sewage arrangements, where many people just poured their waste into the street however they wanted. There were also big public toilets that had room for lots of people at the same time (this one is from Ostia). Apparently, Roman people weren’t shy about all going together in one big room! Did Roman women use the public toilets? 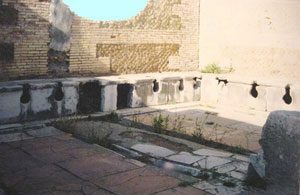 Nobody knows whether Roman women used these public bathrooms along with the men, but there aren’t any separate women’s rooms, so they probably did. 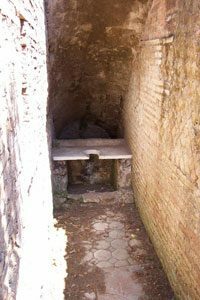 Unlike latrines in China, in Rome people sat down to go to the bathroom. They didn’t have toilet paper, so they used bits of broken pottery (rounded off so they weren’t sharp) instead. Roman toilets drained into the sewer pipes underneath them. Then the Roman sewers just dumped raw sewage into the river, which was better than leaving it lying around in the streets, but still did spread germs sometimes. 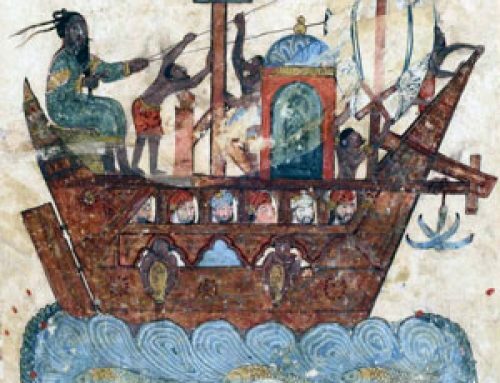 The Romans didn’t have any way of treating sewage to kill the germs, as we do today. And they didn’t understand that germs made people sick. The inside of the tunnel that drains water from the Roman Forum – the Cloaca Maxima. 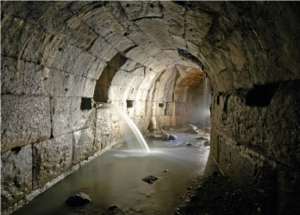 Some of these Roman sewers are still being used today. In Rome, the Cloaca Maxima, the Big Drain, still carries rain water away from the Roman Forum to the Tiber River. In smaller towns, though – most of the towns in the Roman Empire – there weren’t any sewers. Sewage collectors came through and got the poop from each house and carried it off to sell to farmers to use as fertilizer on their fields, just like in ancient China at the same time. In small villages (where most people lived), they didn’t even have outhouses, and people just walked out to the fields every morning and pooped there. Are you looking for a second source to cite? 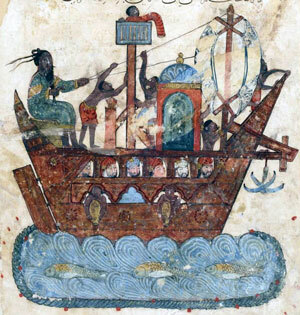 Check out this great article on Roman sewage from a real expert. Roman aqueducts brought clean water to Roman towns, and Roman sewers carried away dirty water from storms, and from Roman toilets (really latrines). 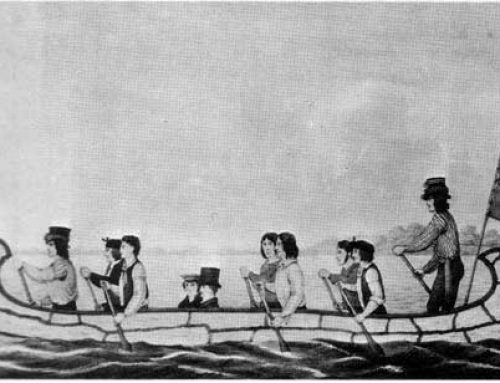 Cite this page: Carr, K.E. Roman sewers – ancient Roman toilets, poop, pipes. Quatr.us Study Guides, September 5, 2017. Web. April 21, 2019. You’re welcome, Ryan! If your teacher or school librarian want to help us get the word out, we’d love a link to this article! Or can you sponsor this article on our Patreon at https://www.patreon.com/quatr_us ? This worked great! Very interesting and informative! This helped me a lot with a school assignment! This was a great article! It really helped! Thanks, Ciena! I’m delighted to hear we could help! Glad we could help, Dennis! This helped with schoolwork. Thanks! You Rock! 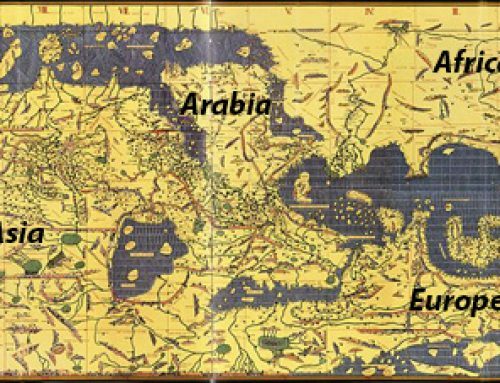 You helped me finish a very important project on the Roman sewer system. Thank you! Wonderful! I’m glad we could help, and I’m sure your project will come out great. Wonderful, Will! I’m glad we could help. Thank You! This really helped me on a project for my school. You’re welcome, Tucker! Thanks for stopping by. I hope your project comes out great!